Show their interviewer that they are serious about this position. Prove that they have done their homework. Find out if this is truly a good match. Be better informed about their overall job search. Display confidence in this traditionally nerve-racking step of the hiring process. Gain in depth knowledge about the position, beyond the job description. Asking this question will show that you are interested in growth and improvement. You’re letting them know right away that the status quo won’t do for you. The answer will let you know what kind of training they offer or if there is room for advancement in the company. This is a great way to gain insights into promotions without directly asking. Furthermore, you will probably gain some information on how they handle employee reviews. Asking the question shows that you are big on meeting expectations, and you understand that the way to do that is through communication. The answer will let you know how strategic (if at all) this company is about its talent management. Generalities will let you know that it hasn’t really thought about it. Concrete, measurable answers will tell you that the company means business. Asking this question lets your interviewer know that you are interested in more than average. The answer will let you know firstly, if the company even knows who its top performers are. If it’s obvious that the hiring manager doesn’t, I can almost guarantee you that there is a lack of motivation and recognition in this workforce. If interviewers can rattle the common traits off, this displays a level of insight and engagement that should be of interest to you. Oh yeah, and now you know the traits you should develop or accentuate. Asking this question might seem ballsy, but these are some serious need-to-know questions. If the worker formerly in this position worked an average of 60 hours per week, that is something you’ll want to be aware of. If this a new position and expectations are up in the air, that is also pertinent information to you. The answer will let you know how defined this position is and if the interview actually has an understanding of the requirement beyond a personality test. 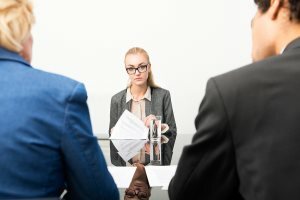 Asking the question lets the interviewer know that you do expect follow-up communication, even if it’s a call to let you know that you didn’t get the job. A call to action is always great to end with. This type of question also shows that you drive things forward rather than waiting around for others. The answer to this question could grant you some body language/tone insights as to how well you did. Prompting this call to action could potentially get you an answer faster, or key you in on what to expect. I would say to not read too much into the answer, but who would I be kidding?